When you create a new item, you can enter an opening cost price and quantity on hand. Thereafter, the quantity adjusts as you purchase and sell the item. The cost price adjusts as you purchase items. The system calculates a new cost price, using average costing, each time you purchase items. You may enter an incorrect cost price when you purchase, and the system then calculates the new price using incorrect data. You may purchase into the incorrect item, with a different cost, and the system calculates a new cost price that is not correct. You will also have the incorrect quantity on hand for both the correct and the incorrect items. You may have stock losses through errors, theft, or breakage, and so the quantities on hand can become inaccurate. You use this function to correct errors such as these. You can also use this function to make percentage adjustments to selling prices for a range of items. You can adjust the selling price or the quantity on hand. Click on the Next button to see the Adjustment Results. The value of Item Adjustments will be reflected on the Profit and Loss report, in the Cost of Sales section. Item Adjustments does not affect the Trail Balance. Enter the Adjustment Date as well as the Reason for the adjustment. Accounting allows you to import new items. 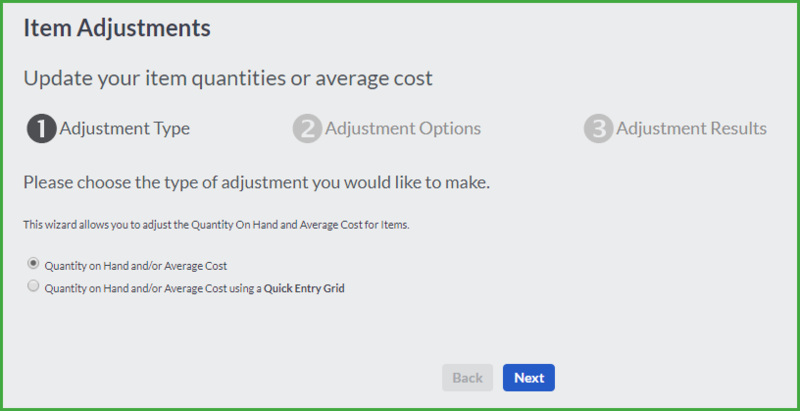 You can only edit the New Avg Cost and New Qty on Hand fields. Click on the Save button to process the adjustment. When you purchase an item, you can enter an opening balance and a date at which the balance applies. Once you process any transactions for the record, you cannot change the opening balance fields in the edit function. Instead, you use this function should you need to change the opening balance. 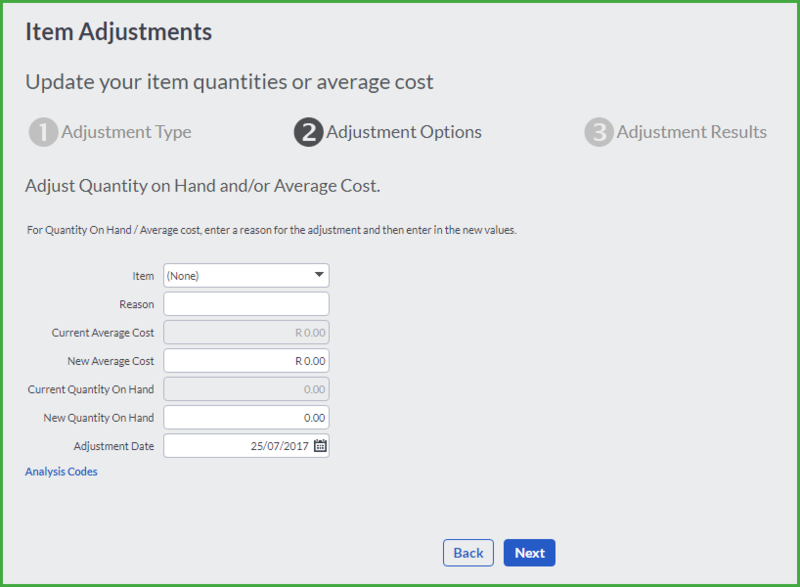 Click on the Items…Special…Adjust Item Opening Balances option. 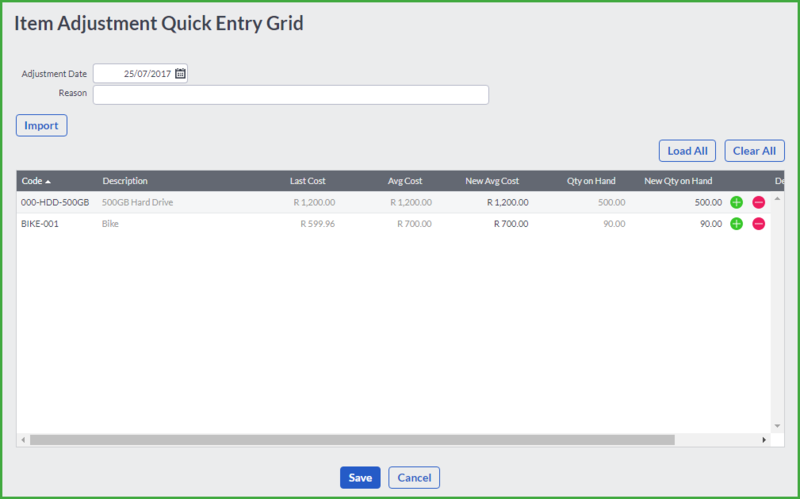 This option will adjust the opening quantity and opening cost that you entered when creating an item. You should only use this option if the opening balance values you entered were incorrect and you are unable to change them because you have processed transactions using the item. Adjusting the opening balance will not recalculate your average cost. Select the item from the Item drop down menu. Enter a reason for the adjustment in the Reason field. Enter the new opening balance in the New Opening Balance field. Select the date when the opening balance was adjusted in the Opening Balance as At calendar look up field. Click on the Save button to save the adjustment that was made. If the opening balance period falls within a closed VAT period or a locked financial year, you will not be able to adjust the opening balance. It is recommended that you seek professional advice from an accountant or auditor before adjusting your opening balances.